TNBTP has consistently brought to your attention the “Black Swan Event”. We recently posted about it. The above book has brought to our attention the likelihood of another Black Swan Event. If you were ever scared by the horrors of Halloween, read this book and you will be scared out of your skin. 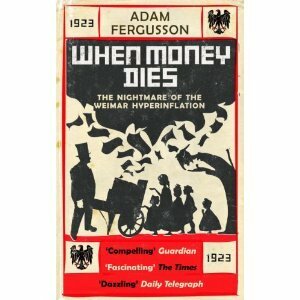 The story vividly illustrates the resulting demolition of the German currency during the Weimar Republic. Andrew Stuttaford (who writes frequently about culture and politics, works in the international financial markets) writing for the Wall Street Journal describes the concern of Fergusson in his own words as follows: “His examination of both the seduction of inflation and its devastatingly corrosive effect is merciless and horrifying. Most haunting are the depictions of those broken on inflation’s wheel, the workers without a union to protect them, the retired trying to live on pension that had lost all meaning, the once-proud bourgeoisie after the annihilation of their savings. A nation can recover from hyperinflation, but for these people time had run out. Everybody ought to read this book. But baby boomers must.